When we held the first copy of Stumbling Stone and looked at the cover, felt the pages and smelled the print, we felt like proud parents of our new baby. We felt that we had finally finished and that this was more or less “it”. 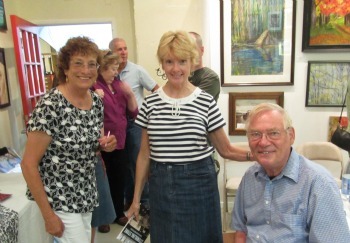 quickly we had events scheduled in libraries, bookstores, art galleries, congregations and with book groups. Friends like Linda Peonsin, Mike Nelson, Linda Flamm, Peggy Tunder and others helped make those connections. Our website, with its blogs and photos, was fun and so was our Facebook page. What we did not expect was the amount of interesting and unusual people whom we met. At Book Passage in Corte Madera on Small Business Saturday, we met Robert Heller who was also selling his book. We noticed his German accent and began chatting with him. Turns out that he and Rudi came from the same area in Germany and had more or less the same education. He came a few years before and he too got a Ph.D. from the University of California, Berkeley. His book, The Unlikely Governor, describes his journey from a professor at UCLA to the Board of Governors of the Federal Reserve. At our book reading at the Jewish Community Library in San Francisco, Julie reminisced with a former colleague, Harvey Smith, author of newly published Berkeley and the New Deal. 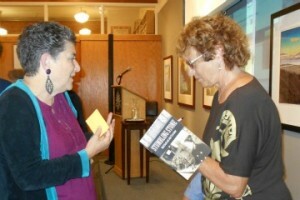 Gael Chandler, who wrote Chronicles of Old San Francisco, also came to lend her support and introduce her Jewish wife. At the end of that San Francisco book event, an elderly woman came up to us with a smile and said “I was a partisan in Poland. We hid in the forest and attacked the Nazis” Mira Shelub’s book Never the Last Road describes the death of her family at the hands of the Nazis and how she avoided almost certain death. child in Holland; at a Great Good Place for Books a couple showed photos of the stumbling stone they had just seen in Berlin installed for their grandfather. In Ohio, at the Book Loft in German Village, a young woman said she wanted Stumbling Stone for her elderly Jewish grandparents in Ohio. Never in our dreams did we think publishing Stumbling Stone would lead us to meet these people and hear such amazing stories.